Congressman Tim Walz, who last week was re-elected to the U.S. House of Representatives for a second term, faced tough questions Wednesday from some of his biggest critics: students at Grand Meadow High School who wanted to know what he was going to do to secure their futures. Walz, DFL-Mankato, spoke to students about his role in Congress, and about their own roles in the country's future. Students asked a range of questions, from where Walz lives when he spends his weeks in Washington, D.C., to what he plans to do about the national debt, failing economy and job losses. 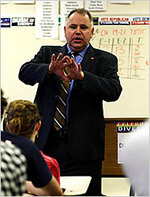 Many of Walz's responses emphasized the importance of education. Walz also remained mum on whether he plans to run for governor in 2010. "Right now I'm focusing on getting through this re-election, so no decision yet," said Walz. Voters and average citizens probably thought the political fighting and acrimony should have ended Nov. 4. Unfortunately, there appears to be a few more weeks or months of political nastiness they will have to endure. “I don’t want to tell people they don’t have a right to swear — they do. Just not at my party.” — Free Press Publisher Jim Santori, explaining the reasons behind the decision to shut down the forum on this Web site. After a few days of seeing vote corrections land on the Franken side, Republican Senate Candidate Norm Coleman received some good news from Cottonwood County--he gained one vote. The error was found during a routine audit of county scanning equipment on Wednesday. Cottonwood County Auditor Jan Johnson said a voter used a pencil (instead of a pen) and didn't mark the ballot dark enough. Consequently, the vote was not read by the scanner. Only two of the county's 28 precincts were tested on Wednesday. However, Johnson says the public should not expect a major change, once next week's local recount is complete. . . . Since election night, [Nobles County Auditor Sharon] Balster has had to meet special requests from both the Coleman and Franken campaigns — including making copies of all of the tapes from the counting machines, providing information on the number of absentee ballots mailed out, returned, accepted and rejected. Both political parties had representatives present at last Friday’s board of canvass meeting and Monday’s post-election review. “My list of things to do is enormous,” Balster said. "We feel very fortunate (to win) because the congressional candidate (Republican Brian Davis) got 33 percent in the district, the presidential candidate (Republican John McCain) got 42 percent, and I got 51 percent. So we're excited." The 2006 margin was so close that it triggered an automatic recount in the state house district. A Republican friend in the First shared news that Davids has been mentioned as a potential candidate to run for the congressional seat in 2010, but we've heard no more about this rumor. Since Davids retains his seniority in the Minnesota House after sitting out a term, it is likely that he will garner his share of earned media. The 2008 GOP congresssional candidate in the First questioned the emergency food shelf aid in the Farm Bill; this may not have been the cycle to challenge such programs. Federal aid to food pantries is not enough to meet the need and is intended to be a supplement to private support. The unfortunate need for emergency food assistance is clear as we read the district's papers. On Saturday, Boy Scout troops from all over Steele County will be out in the county collecting food donations from people’s door steps beginning at 9:30 a.m. All donated food will be sent to the Steele County Food Shelf. Tom Barry, district executive for the Game Haven Council (which oversees Steele, Dodge and Goodhue counties), said they are looking for a variety of different foods, including canned fruits and vegetables, soup, pasta and flour, to name a few. “We hope that people have their food out by about 9 a.m. this weekend,” Barry said. . . .
. . .If people miss putting out the food for Boy Scouts on Saturday, there will be two other drop-off sites. They include the Steele County Food Shelf or at the old Century 21 Building at 1836 Cedar Ave., located next to Godfather’s Pizza. Both drop-off sites will be open from 10 a.m. to 1 p.m. Saturday. Trom added they are looking for additional volunteers to help sort food donations at the old Century 21 building and then bring it to the Steele County Food Shelf. If people don’t have food to donate, Trom also said monetary donations help. Because the food shelf is a non-profit, Trom said the organization is able to pay for more items at a store compared to the average dollar. Food shelves across the district need donations. The Waseca County News looks at local demand in Food shelf stocked, but empties fast. Photo: Walz returning to his Mankato West classroom in his first term. Washington's got nothing on the tough crowd in the public schools. Photo cribbed from the NYTimes.